Every homeowner definitely has the same problem in terms of storage, and that is, either they do not have enough closet space or they just simply do not know how to maximize what they already have. Here’s a step-by-step on how to maximize your closet space for full functionality. Step 1: Asses you closet’s storage capacity. Raid your closet and assess its current situation. Be sure to take down notes on what you have, particularly those that are still being used. 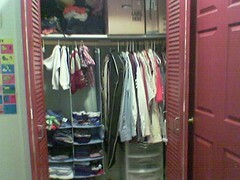 You must take important measurements and photographs as well for better documentation of your closet’s storage capacity. In this manner, you will know what you need in order to maximize the space that you have. Step 2: Sort the contents. The best way to maximize your closet space is to sort the things inside them. Empty the contents of the closet by sorting out your things into three categories: for keeping, for disposal, and for donation. In this way, you will be amazed by the amount of storage space that will be saved from your closet. Step 3: Use organizers and accessories for the closet. There are lots of organizers and accessories that are available in the market for increasing your storage space. There are a good variety of accessories that fit any budget. There are some that you can do for yourself, while others need a contractor to do it for you. All you have to do is decide on what you really need and what your budget can afford. Add some fun in buying your organizers by choosing colorful ones. This will help you be more inspired in organizing your closet. Step 4: Know some organizing techniques. Organizing your things properly is a very important skill that most of us find it too hard to deal with. The following are just to name a few techniques to get the most out of your closet space. It is important to note that self dividers will be very useful in keeping your stack of jeans and sweater from collapsing. Hooks are also very useful for hanging your scarves, belts, and other accessories. It will be more effective to use acrylic or wooden hooks instead of wire hooks to prevent damage to your clothes and other closet stuff. Group your long hanging clothes and low hanging clothes together, and put a shoe rack or other boxes under the low ones to maximize the space. Maximizing your closet space may seem to be a very tedious job, but it is also very rewarding. Your just need little system in starting out this precious task. Prior to any step, you need to know your closet more by assessing its storage potentials. Learning simple organizing techniques is vital in order to come up with a very neat and well managed closet. Organizing Closet – Organizing closet to create more space. Post-party Clean-up – Cleaning up and organizing the clutter at home for more space. Setting Table – Keeping things on their proper order or places. Organizing Catch-all Closet – Organizing closet to have more space. Sorting Things Out – Sorting out things and arranging stuff at home. Lot of things have said about organizing closet, and there are already lots of tv programs that teaches consumer how to organize closets and maximize space, but then again no matter how hard you try to teach people to clean, sort and organize if the person doesnt want to learn and is truly undeniably disorganize and messy it wont work. why? because for many, an unorganized closet doesnt have anything to do with their lives. There are a lot of things than to be obsessive about than organizing one’s closet. To maximize your closet space, try not to be such a pack rat. If you haven’t worn certain clothes in 6 months, most likely, you will not be able to wear them at all. So, don’t keep them in your closet anymore. Give them away to those who may have a need for it. Remember this; you will always buy new clothes and keeping those that you no longer use will just be a clutter in that closet. So don’t think twice in giving those clothes away. Another way to maximize your closet is by using an airtight Ziploc bags where you can vacuum out the air. These bags make clothes appear flat and thin so when you store them in your closet it will not take up much space.